Some popular colored gems, like tanzanite and tsavorite garnet, are recent discoveries. Other gems, like sapphire, ruby, garnet, emerald and jade have been known since antiquity. Peridot is one of the gems with the longest recorded history. The ancient Egyptians mined peridot on the tiny Red Sea island of Zabargad, the source for many large fine Peridots in the world’s museums. High quality peridot can be a spectacular gem, especially in larger sizes. But peridot is notable not only for its beauty. It has some unusual properties that make it quite unique in the gems world. Most gem varieties are formed in the earth's crust. The two exceptions are peridot and diamond, which are formed much deeper in the earth, in the earth's mantle. Peridot forms in magma in the upper mantle, about 20 to 55 miles deep; and it is brought to the surface by tectonic or volcanic activity. Diamond is formed even deeper in the mantle, around 100-150 miles below the surface, at extreme pressure and temperature. Peridot is one of the few gemstones that comes in only one color. Peridot is an idiochromatic gem, meaning it is colored not by trace elements, but rather by its essential chemical composition. Peridot is green because it contains iron, and the depth of green depends on the percentage of iron in its crystal structure. Peridot can vary in color from yellow-green to apple-green to olive green. Another unusual fact about peridot is that peridot crystals have been collected from some Pallasite meteorites. A Pallasite is a rare kind of stony-iron meteorite of which only about 60 specimens are known. Peridot is thus far the only gemstone mineral found in meteorites. Important peridot sources are Burma, Pakistan, China, Vietnam and the United States. The finest quality peridot has traditionally come from Burma, though the Pakistani peridot is now highly regarded as well. The USA was for many years the largest peridot producer, with major deposits in Arizona. It is estimated that 80% to 95% of the world's production of peridot comes from the USA, mainly for commercial quality peridot. The largest known cut peridot is 310 carats and is in the collection of the Smithsonian Institution in Washington, D.C. Peridot is a relatively inexpensive gemstone in small sizes, but the value goes up with stones over 5 carats, with 10-15 carat stones counting as very rare. There is no known treatment to improve the color or clarity of peridot, so peridot is always an untreated gem. Peridot is the birthstone for August and is the 15th anniversary gemstone. This month we feature fine Peridot, Rubellite Tourmaline and Imperial Topaz from our collection, including some superb new Pakistani Peridot that we've just acquired. An amazingly vivid Rubellite Tourmaline from Mozambique. This fiery hot pink pear is very clean for Rubellite and will make a stunning ring or pendant. Guaranteed natural and untreated. An outstanding matched pair of rare Rubellite Tourmalines! These well-matched pear shapes are bright and fiery, with a vivid pink-red color that you can see across a room. Well sized for an exquisite set of drop earrings. Guaranteed natural and untreated. A lovely Imperial Topaz in a rich golden orange color. Completely clean, this fine material has been precision cut for maximum brilliance. At 10 x 8 mm, this fine gem is the perfect size for an impressive ring. Guaranteed natural and untreated. An exquisite matched pair of rare imperial topaz from Ouro Preto, Brazil. These elegant pears for earrings display a rich sherry color. These are beautifully matched gems, exceptionally clean and well cut. Guaranteed natural and untreated. A top grade Peridot from Pakistan in a gorgeous deep green. Large size, wonderful color and top clarity, this fine gem Peridot will make a spectacular piece of jewelry. Guaranteed natural and untreated. A stunning Peridot from Pakistan in a hard-to-find square radiant cut. Superb saturation, perfect clarity and precision cutting make this an ideal piece for the serious collector. Guaranteed natural and untreated. A rare Spinel from 17th Century India, believed to have been worn by Mughal emperors, has been auctioned for more than $350,000 at Sotheby's Arts of the Islamic World auction in London. The Spinel is inscribed in minute Persian script with the names of Emperors Jahangir, Prince Khurram and Alamgir Aurangzeb. The gem first came to the UK in the 1920's and was offered at auction for the first time. The Apollo and Artemis Diamonds have become the most valuable earrings ever sold at auction, selling at Sotheby’s Magnificent Jewels auction in Geneva for a total of $57.4 million. 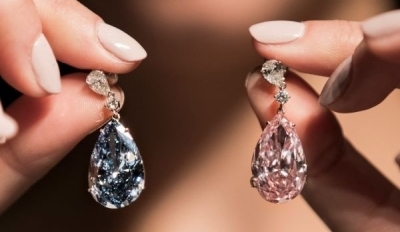 The two pear-shaped fancy color diamonds, one pink, one blue, were offered as separate lots. The "Apollo Blue" a 14.54-carat, fancy vivid blue, internally flawless diamond, sold for nearly $42.1 million, while the "Artemis Pink," a 16-carat, fancy intense pink, VVS2-clarity diamond, sold for over $15.3 million. Morganite is quite a hard gem with a rating of 7.5 to 8.0 on the Mohs scale. High quality morganites tend to be very clean and structurally sound, so they are very durable gems. They have become quite popular for engagement rings, based on their subtle color, uniqueness and attractive price per carat. Of course they will scratch more easily than a diamond, but they may be less likely to chip. And they can easily be repolished after some years to keep them at their best. You'll mainly find hot pink colors in pink sapphire, spinel and rubellite and pink tourmaline. Indeed, we feature a gorgeous hot pink rubellite in this month's newsletter. For the rare gem collector, you'll also find some hot pinks in pezzottaite, a very rare stone from Madagascar.